I like to be at the polls when they open. 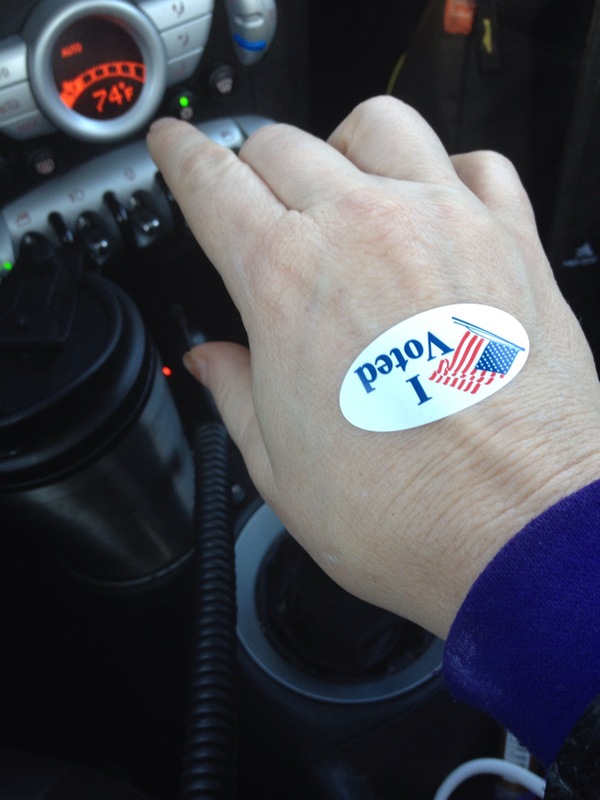 My precinct has a good system of early voting, but my preference is always to go on The Day. Perhaps I’m old-fashioned, but it reminds me of that very first election I was finally able to participate in after I turned 18. Hubs and I got there about 15 minutes early, and I almost cried tears of joy. The parking lot was already nearly half full. I have never seen that strong of a turnout in my precinct for a mid-term. First in line was a young couple that I know in that special small-town way of “knowing” people – she is the manager of a local fast-food place; my son worked for her briefly during high school. He has a brother who used to attend our church. I see them there, at the polls first thing in the morning, every other year. It’s like a regular appointment. Other people who waited there with us included a bunch of hunters in camo with orange caps, a team of construction workers, and a really nice lady right in front of me who saw my leather jacket and struck up conversation about motorcycles. It was cold out there waiting, but everyone was cheerful, chatty, friendly. There was one man there “electioneering,” but he was also pleasant, stayed outside the perimeter, and really didn’t DO anything at all. He just said “good morning” and “welcome” to everyone who arrived while wearing hi candidate’s t-shirt. When the doors opened up, The election officials were all friendly and jovial as well. It was all very fun, far more pleasant than I had expected given how contentious some of our races were. But the most exciting thing was the turnout! I know all kinds of different factions had strong GOTV pushes this year, I was so thrilled to see what looks like actual results! Have you voted already? I don’t want to know who you voted for or what your hot button issues are. That is entirely your personal business. But please, if you haven’t yet, go and vote!